A traumatic brain injury (TBI) is caused by a sudden jarring of the brain. This happens from a blow, jolt, or penetrating object, such as a nail or other piece of metal. The brain is an incredibly delicate organ, and, of course, maintaining its health is extremely important. While most TBI victims recover within a few weeks, some find themselves dealing with the after effects of their accident for the rest of their lives. 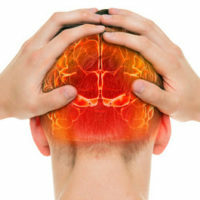 Many traumatic brain injuries are the result of workplace accidents. According to the Centers for Disease Control and Prevention (CDC), falls are the leading cause of traumatic brain injuries, accounting for 47 percent of TBI injuries. Twenty percent of workplace TBIs happen when an employee has a slip and fall caused by a wet, uneven, or cluttered walkway, according to the Brain Injury Society. This means that even office work and other sedentary forms of employment pose a risk for a TBI accident. Being struck by or against an object is the second leading cause of TBIs, while motor vehicle collisions account for the third leading cause. Occupations that involve manual labor or being exposed to motor vehicle traffic (including professional drivers) are therefore the most at risk when it comes to TBIs caused by objects and motor vehicle collisions. Falls from rooves, ladders, and scaffolding also result in serious TBIs. Depending on the severity of a victim’s TBI, it may take weeks, months, or even years to return to his/her pre-accident mental and physical capabilities, if full recovery is even possible. Returning to work can be incredibly difficult after any trauma, especially when the brain suffers an injury. Researchers found that 50 percent of TBI patients with severe brain injuries were unable to return to work after a one-year period. Furthermore, 20 percent of TBI patients in the survey who had a suffered more mild injuries were unemployed. Other peer reviewed research pointed to the importance of emotional, societal, metacognitive, and environmental factors for a successful return to work after a TBI. This means that a TBI patient must be given the time and medical care needed to recover fully. However, many employers fail to fully comprehend the difficulties of a moderate to severe TBI, and urge their employees to return at once or terminate their position. Injured employees must avail themselves of Florida’s workers’ compensation laws in order to ensure their future physical, psychological, and fiscal health. Whether your traumatic brain injury was mild, moderate, or severe, you deserve the medical care and wage replacements available to all Florida workers. Workers’ compensation can help get you back on your feet and enable you to continue providing for your family. Call Celeste Law Firm today at 561-478-2447.